I’ve been trying to get to Papasito for ages, but it just seems to have evaded me, either through it closing for a break or because we just couldn’t get ourselves organised. “We must go to Papasito” had become a familiar mantra. Finally, I caught up with some friends for dinner there on a freezing winter night. To save thinking we opted for the $45 vegan banquet and ordered a variety of cocktails, wine and beer to match, all of which were good. 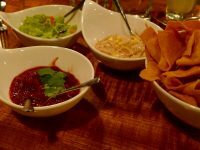 We started with a generous serve of house made corn chips that came with a delicious salsa roja, guacamole and cashew cream. We scoffed the lot because they were so tasty. The corn chips were thin, light and crispy. 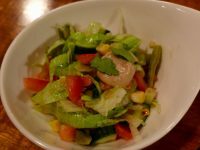 The next course was a palate cleansing salad with lettuce, tomato, cucumber, corn and cactus. It left my mouth zinging, with a bit too much pepper for my taste, but I otherwise enjoyed it. Next up was a plate with a soft open tortilla with impeccably cooked eggplant, with roasted potato, onion and corn. 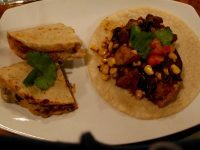 It was accompanied by two half quesadillas with different fillings, one pumpkin based and the other blackbean. 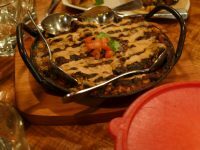 This is probably where we should have stopped…but a hearty blackbean and mushroom casserole was next up, served with a stack of warm tortillas. We were all too full to do it justice and it was a bit the same in flavours as some of the previous dishes so it didn’t encourage us to gluttony. 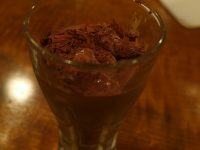 Lastly came the cashew vanilla dark chocolate mousse. It was fabulous, not too rich and I managed to eat it all despite being REALLY FULL. The food was perfect for a winter’s evening, solid, warming and hearty. I’d go back, but next time I think I’d order a la carte to have less food and perhaps a bit more variety. oh gosh I’m the same with Papasito, always meaning to get there but something comes up or I don’t fancy going on my own now that friends and family have moved away!